The acclaimed book on macular degeneration—now completely revised and updated with cutting edge research and the latest developments in the field. Plus a Low Vision Living Rehab program to help you read better, see better, and live independently! How I Beat Macular Degeneration in the Early Stages and How You Can, Too! ?This is one of the rare books in low vision that I could not put down once I started reading. 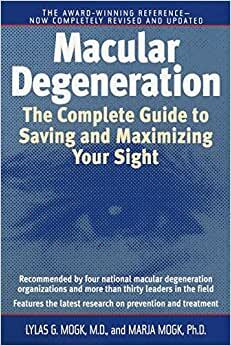 This book should be read by everyone with macular degeneration, as well as their families, friends, and doctors. . . . It will be required reading for all my residents.? ?An outstanding book?not only educational but inspirational. Everyone with macular degeneration, their family members, and all eye care professionals should have a copy.? ?This book should be read, highlighted, and used as a guide by everyone who has macular degeneration, or is at risk of developing it.? Lylas G. Mogk, M.D., is a practicing ophthalmologist and founding Director of the Visual Rehabilitation and Research Center of Michigan, part of the Henry Ford Health System. Dr. Mogk is a member of the American Academy of Ophthalmology's Low Vision Rehabilitation Committee. She lives in Grosse Pointe with her husband, John, and her father, Charles R. Good, who has advanced macular degeneration. Despite his severe vision loss, Dr. Mogk's father lives a full and active life following the principles presented in this book. Marja Mogk is a freelance writer and editor based in Berkeley, California. She worked for several years in social welfare counseling and maintains an active interest in this field. She is Lylas and John Mogk's daughter. 3.0 颗星，最多 5 颗星A little bit dated. Discussions of audio tape cassettes in the appendices are worrisome. I did learn quite a bit about the condition that I didn't know. My mother had wet macular degeneration and diabetic retinopathy in the 1990s. Not much available for treatment. I have been diagnosed with incipient dry macular degeneration and, having worked in Retina Medical Group for a brief time, I knew I had to take action. I have been getting annual eye exams due to my diabetes and that's how it was identified. I don't have any vision loss apart from a gigantic floater in my right eye that I've had for 10 years. This book has valuable recommendations concerning diet and behavior that aren't difficult to implement. That said, I think the authors are Vegans based on the detailed recommendations on food acquisition, purity of essence, and preparation details. There is no discussion of frozen vegetables and their benefits and attributes. It's like the only thing that exists or matters is fresh stuff purchased in hippie natural food stores. The recipes appear to be way more involved than I will ever perform and I wonder if they don't have a cook working for them? Anyway, it does present useful information about definitions, treatments, resources, and anecdotes about other MD participants. It just needs some updating and a slight change in direction to discuss real food and real people. What a great resource! This book is full of information - from telling what Macular Degeneration is to practical ideas on how to live with it. As the wife of a man who has AMD, this was exactly what I needed to help me understand some of what he is going through. I have gotten many ideas on ways to make his life easier. Included in the book's appendixes is information on groups and companies that help or make things for people with low vision. My only complaint is that the book is 10 years old. Even so, it still is proving to be extremely useful, and I would recommend it to anyone who has (or knows someone who has) Age-related Macular Degeneration. My Dad was diagnosed recently with Macular Degeneration. I immediately started searching for information for him to read on this condition. He couldn't say enough positive remarks about this book. It has helped enlighten him in the direction he needs to go regarding treatment in the future. 5.0 颗星，最多 5 颗星A very helpful and encouraging book!! I have found this book very informative and written in a style that is very comforting and informative. My doctor is a good doctor but did a very poor job of explaining what macular degeneration is all about and how to deal with it. There are a lot of helpful extra things in it to encourage a person with this disease and help you to realize the world hasn't come to an end for you even though you've got a real challenge ahead of you in dealing with it. 3.0 颗星，最多 5 颗星Some of the material is out dated. This book contains a lot of out of date information about AMD. It's still a good read because the material about dealing with the life aspects of living with low vision are still valid; however, much of the "science" stuff is outdated.